The State of Gujarat in India conducts Jagannath Rath Yatra similar to the world famous Puri Jagannath Ratha Yatra and the most popular is the Ahmedabad Rath Yatra. In 2019, the date of Rath Yatra in Gujarat is July 4. In 2019, it is the 142nd year of celebrations. The Rathas used in the Rath Yatra are small in size compared to the huge Rathas in Puri. 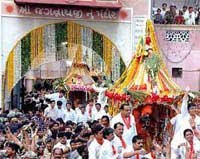 In Gujarat, Rath Yatra is also held in many cities and towns like Bhavnagar, Vadodara, Gandhinagar, Surat and Porbandar. The Rath Yatras in various cities, towns and villages in Gujarat take place on the same day when the Puri Jagannath Rath Yatra takes place. Three small chariots with the idols of Lord Jagannath (Krishna), Balarama (Balabhadra) and Subhadra are pulled by the devotees through the cities, towns and villages. Thousands of devotees throng the streets on the day to have a ‘darshan’ of the deities. The Ahmedabad Rath Yatra has a history of 141 years. 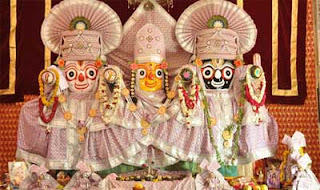 The procession begins from the Jagannath temple in Jamalpur locality in Ahmedabad city and passes through a 14 km route. One of the main attractions during Ahmedabad Rath Yatra is the procession of caparisoned elephants. Decorated elephants take part in almost all the important rituals associated with the Ahmedabad Rath Yatra. Another important feature is the participation of Akhada Sadhus and Mahants and the numerous floats with different themes. After a day-long procession, the chariots with deities return to the Jamalpur Jagannath Temple. How to watch the Ahmedabad Rath Yatra Live Online?